Solenophora calycosa in the streamside habitat characteristic of many gesneriads. Gesneriaceae occupy an extremely wide range of habitats. The altitudinal range is from sea level to nearly 5000 m (Corallodiscus kingianus). Therefore, it is not easy to identify special and limiting ecophysiological factors for the family. One factor seems important for almost all Gesneriaceae irrespective of habitat type: high humidity, necessary either throughout the year or at least in distinctive growing periods. 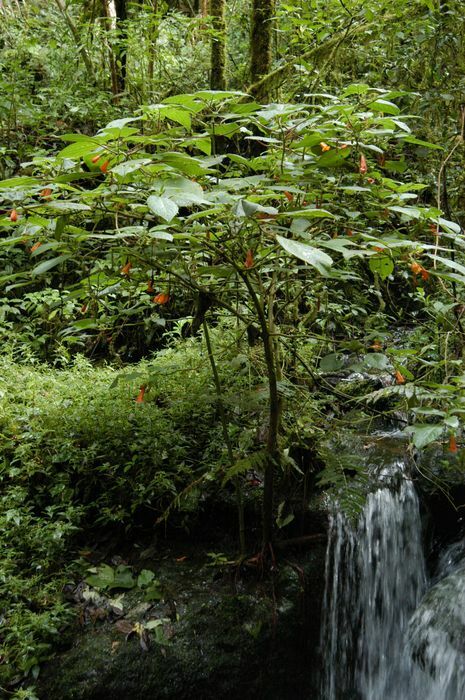 At low altitudes, gesneriads are predominantly bound to forest habitats, growing in damp, shady places on slopes or moist rocks, often near streams or waterfalls. In the equatorial rain forests of Asia there are relatively few gesneriads in the lowlands (e.g., Cyrtandra, some species of Codonoboea and rock plants such as Monophyllaea, Epithema, Paraboea etc. ), but they abound in the montane forests with their cool and ever-moist conditions (e.g., Codonoboea, Loxocarpus). This distribution is mirrored in the neotropics, with few species occurring in the lowlands, e.g., Amazon basin, but abounding in the Andean uplands. More open habitats are rocky, damp and humid gorges, the home of many Streptocarpus species in South Africa. Also in alpine habitats (Himalayas, South China, Pyrenees, Balkan peninsula), the plants grow usually in open habitats, but seem to be generally restricted to shady humid places such as rock crevices, overhanging rocks, shallow caves and cave entrances. 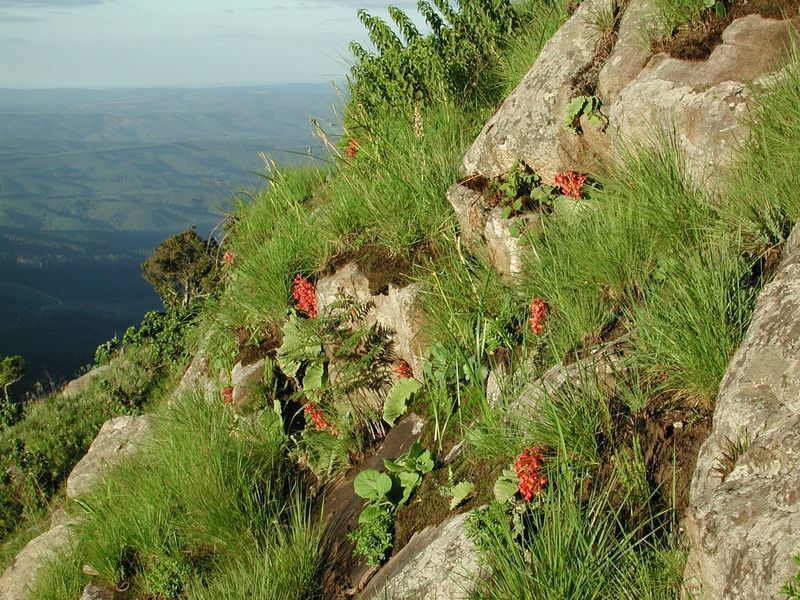 The reddish flowers of Streptocarpus dunnii dot this steep slope adjacent to a gorge, where it benefits from a seasonally cool, moist and humid environment. In the dry season the plant will lose a substantial portion of its single leaf surface, a strategy to avoid excessive transpiration and desiccation. Terrestrial Gesneriaceae growing under constantly warm and moist conditions are not in need of special morphological and/or ecophysiological devices. However, plants living in areas and habitats with periodically changing climate (especially amount of precipitation) had to develop special adaptations and survival strategies, restricting growth and flowering to short periods of favorable conditions. 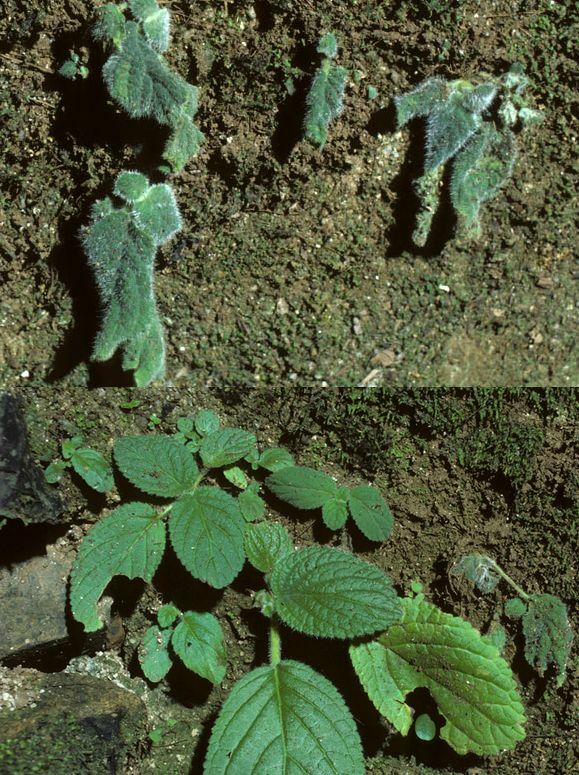 Morphologically, these adaptations include: annual habit, development of seasonal shoots, underground storage organs such as rhizomes, scaly rhizomes and tubers in many neotropical Gesneriaceae, and leaf abscission in Streptocarpus (see the previous sections Life Forms and Growth Patterns and Exceptional Morphologies). Boea hygroscopica becomes desiccated during dry weather, but is able to recover completely when the rains return. Physiologically, the most remarkable feature of many Gesneriaceae is their capability to survive periodical desiccation. In the dry period the leaves shrivel and the plants look dead. However, when moist conditions return, the plants recover fully. Thus they are also called “resurrection plants”. Some species have been named after this ability: the Chinese Boea hygrometrica, the Australian Boea hygroscopica and the Madagascan Streptocarpus revivescens. The European gesneriads Ramonda, Haberlea and Jancaea also are resurrection plants, and most probably species of Corallodiscus, Paraboea, Trisepalum (now sunk in Paraboea), the South Indian species of Henckelia and others can be added. Desiccation survival is also facilitated in some species by fleshy succulent leaves (e.g. species of Codonanthe, Nematanthus, Aeschynanthus, Columnea, etc. ).